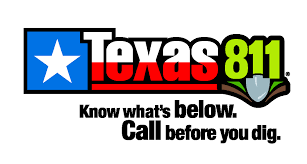 When digging 16 inches or deeper, Texas state law requires that you call 811 at least 48 hours—two (2) working days—in advance to locate underground electric lines. If this law is not followed, you may be fined. You are liable for damages to BCEC facilities and all the liability the Cooperative incurs as a result damages from digging. Whether you are doing a DIY project or if you have hired a professional, make the call to 811 a few days before you dig. The phone center is in operation 24-hours a day, 7 days a week. If planning work on Saturday, call no later than Wednesday. This service is free and will prevent damage to underground facilities and personal injury. Visit www.digtess.org for more information or to submit your request online. Calling 811 is the most important step! BCEC encourages you to do the job safely!